Private Label International has designed the new offices for advertising firm The James Agency, located in Scottsdale, Arizona. The James Agency (TJA), a Scottsdale-based integrated agency specializing in consumer advertising, public relations and digital marketing, relocated to The Quad, a collaborative new office park at 64th St. and Thomas Rd. in November 2017. The new two-story space more than doubled the agency’s previous footprint. TJA’s new office is light and bright with an abundance of glass and a split level open floor plan. Interior design features curated by Private Label International and custom furniture solutions planned by Goodmans Interior Structures give the office more of a hip hospitality feel, rather than that of a more corporate workplace. Industrial elements such as exposed ceilings and concrete floors and walls are complemented by modern finishes such as stylish metal light fixtures, streamlined transitional furniture, white herringbone tile, bright custom wall graphics and bold “TJA orange” accent walls, creating an edgy, contemporary vibe throughout. A custom mural by local artist Timothy Brennan is a statement piece that greets guests as they enter the lobby, which mimics a boutique hotel. Highlights of the office include a massage room for monthly employee massages, a large kitchen with two family-style dining table to accommodate the growing agency’s frequent team meals, three spacious private outdoor patios, and a large open collaboration space, dubbed “The Park,” for Monday morning production meetings, weekly icebreaker activities and other team gatherings. Three fully appointed conference rooms each take on their own unique personas. 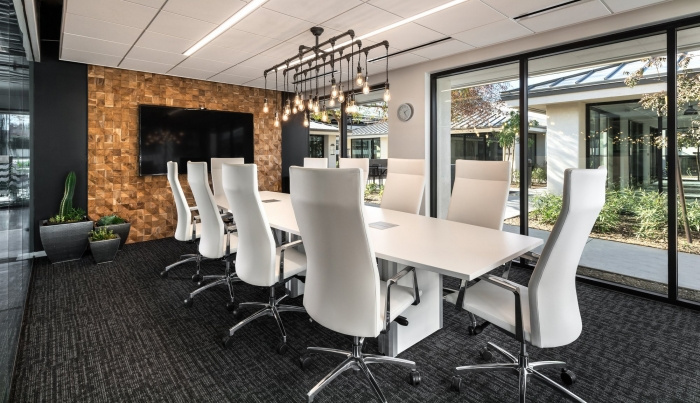 “The Milly,” the largest conference room and showpiece of the office, boasts sophisticated decor, custom lighting and plentiful plug-ins and is reserved strictly for client meetings. “The Garden” features retractable walls that open onto one of the office’s many patios, offering a serene indoor/outdoor space for more intimate meetings. With brightly colored walls and geometric patterns, “The Box” provides creative inspiration for team brainstorms. In addition to smart and beautiful design throughout, technology is a major focus at TJA. State-of-the-art technology features managed by itSynergy include a new WiFi system providing separate networks for employees and guests, wireless video conferencing capabilities, two internet providers to safeguard against an outage and the highest quality video surveillance. TJA is one of the first tenants to move into The Quad community and take advantage of the project’s shared amenities. Offerings include a fitness center featuring Peloton bikes, two private dog parks, an event center with a full catering kitchen, tenant liquor cabinets and lounge seating and the property’s trendy new onsite restaurant, Pitch.